You are hereCongrats to Nate Diaz for a Dominating Win Over Cerrone from Team Santos! Congrats to Nate Diaz for a Dominating Win Over Cerrone from Team Santos! Nate Diaz wants to fight the best, and few could argue with such a request after his performance at UFC 141 on Friday night. The Stockton, Calif., product continually beat highly regarded Donald Cerrone to the punch en route to a unanimous decision victory at MGM Grand Garden Arena in Las Vegas. The “Cowboy” now in his rear-view mirror, Diaz says he’s ready to make a run at the UFC lightweight championship. 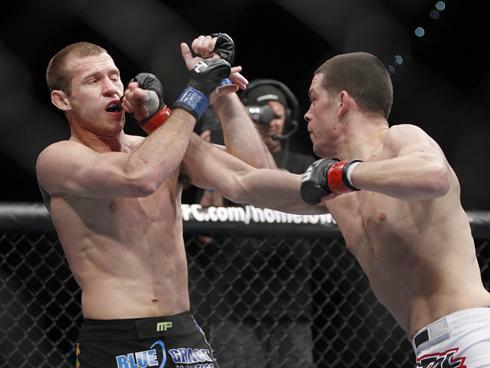 Diaz did exactly that on Friday night, halting the red-hot Cerrone’s six-fight winning streak in impressive fashion. The Cesar Gracie product wasted no time in setting his pace, popping Cerrone with a long jab and following with crisp combinations in round one. While round one was all Diaz, Cerrone managed to put forth a better effort in round two, using leg kicks to disrupt the Californian’s relentless punch attack. Following the bout, the two men shook hands, squashing what appeared to be a legitimate beef leading up to the fight. At Thursday’s weigh-in, Diaz knocked Cerrone’s trademark cowboy hat off of his head and shoved him backward. However, Diaz said that he never intended to play the villain; he simply wanted to fight at his best.